THE NURSES’ STRIKE has been suspended after an intervention by the Labour Court. The move comes after the Labour Court decided to intervene in the nurses’ strike today, with formal talks beginning at 3.30pm this afternoon. It is understood that progress was made during those talks and the Irish Nurses and Midwives Organisation said the planned three days of strikes this week will not go ahead. In a statement, the union said: “The INMO’s elected Executive Council have just received the recommendation by the Labour Court. They have suspended the upcoming strikes at the request of the Court to consider the wide-ranging recommendations. Members will receive more information on the proposals in the coming days and the recommendation will be put to a ballot. It’s also proposed to establish an expert group to examine, in a short period of time, remaining pay and reform issues including those affecting senior management grades. The news of the industrial action being cancelled was welcomed by Finance Minister Paschal Donohoe and Health Minister Simon Harris. Speaking to reporters this evening, Donohoe said he would be recommending to Cabinet tomorrow that the Labour Court’s recommendation be accepted. The finance minister would not be drawn on the cost implications of the Labour Court recommendations, stating that he will be briefing ministers tomorrow and then the Oireachtas on the “financial consequences of the agreement”. He added that the recommendation is “consistent with the public sector stability agreement”. He also acknowledged that other unions would be eyeing the deal closely but added he believes the potential deal would be consistent with the Public Service Stability Agreement. Health Minster Simon Harris said the last few days have been disruptive to the health service, but that he will be working closely with the HSE to ensure the recovery plans are put in place so that appointments which were cancelled can now be rebooked. Initial talks between the INMO and government negotiators at the Labour Court had ended at around 3am without any concrete resolution. The Court had said it would decide if there was sufficient scope for it to intervene in the dispute. 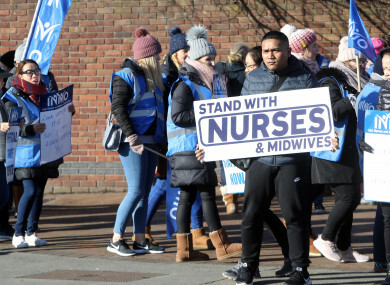 About 37,000 nurses and midwives have been engaging in strike action over pay and staffing levels. Nurses and midwives said they are underpaid and understaffed, meaning they cannot safely do their jobs. Email “Strike days by nurses have been suspended after Labour Court intervention”. Feedback on “Strike days by nurses have been suspended after Labour Court intervention”.